Pensacola News Journal recently did a great article on Sharon and I about the One Shoe Diaries. They even gave me the front cover. It was a large photo of me sitting on a raod with a shoe in front of me. Pretty cool other than the scowl look on my face :) They did include 2 other good photos inside I liked though. I clipped out the article from the Pensacola News Journal Pelican Magazine and pasted below. Thanks goes to Adam Ziglar for taking the story on and doing a great job! Like estranged carcasses, they lay in waiting. Punished by tires, soiled by exhaust and rain, brittle and sun burnt, they rot on the side of the road. It’s not road kill, at least not in the traditional sense. It’s shoes. Randall Hamilton has spent much of the last couple of years photographing lone shoes on the sides of roads throughout the United States. What began as a desire to flesh out his creative impulses quickly became a life-altering project. The couple, who currently lives in an motor home park in Milton, began his journey about a year after Hurricane Ivan destroyed their rented condo on Pensacola Beach. With most of their possessions destroyed, they were essentially homeless; they decided to take drastic measures. The couple began traveling. They’d stay for about two weeks at a time at different stops throughout the country. “I thought that had kind of a ring to it, but not the catch I was looking for,” he said. Hamilton then started noticing single shoes adrift on the sides of roads. After walking along Pensacola Beach about a year after Hurricane Ivan, Hamilton noticed a single flip-flop half buried in the sand. He knew that was the hook, the quizzical curiosity from which he would base an entire journey across the country. “As I started to look for them they started to pop up all over the place,” he said, remembering how he stopped his motor home repeatedly to photograph a shoe. Sometimes laying on the ground to capture the right angle, Hamilton laughs when he thinks about what passersby must have thought. “I’m sure people driving by thought I was a dead body,” he said. 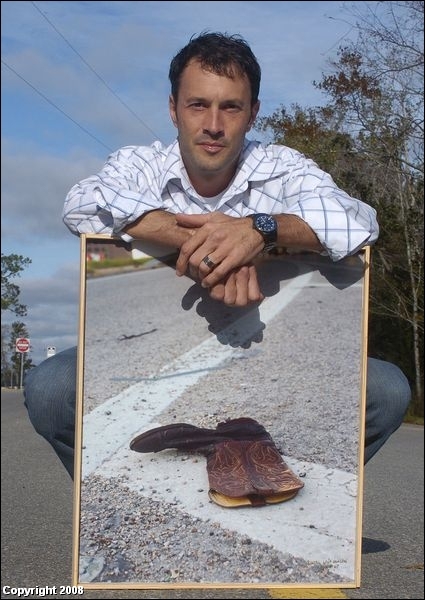 For Hamilton, a deserted shoe on a lost stretch of highway is a work of art. From a deserted Sponge Bob flip-flop to a gnarly cowboy boot in Austin, Texas, to a stiletto high heel cradling the edge of Mulholland Drive and a cliff, the Hollywood sign fuzzy in the background, Hamilton has found all kinds of shoes, each one a piece of art. In all, Hamilton photographed 153 shoes along Interstate 10 from Florida to California. In all, the initial journey took about six months. “I had already ordered a trademark for the ‘One Shoe Diaries’ and I had to call her up,” he said. The premise of her story: a guy becomes obsessed with traveling throughout the country, photographing and exhibiting the shoes. Hamilton called Shapiro to make sure she wasn’t copying his idea. Since then, the two have collaborated and help promote each other’s projects. For now, he hopes to continue to promote his book and seek a publisher. He hopes to do a book tour, retracing his original steps, and promote the book along the way. In the meantime, he’s in the production phase of volume II, his second journey last summer from South Florida to Maine.